I have always loved crumbles and their cousins, buckles and cobblers (yeah, carbs and sweet fruit, I know, I know, what’s not to like). 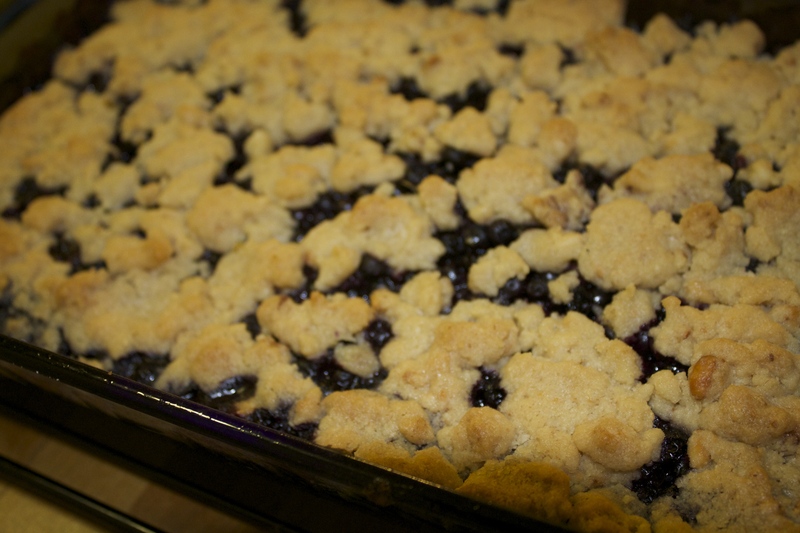 For many these are classic American foods that have been around forever but we were introduced to the crumble in the 1970s by my late mother’s dear friend, Shani Weiner, of blessed memory. 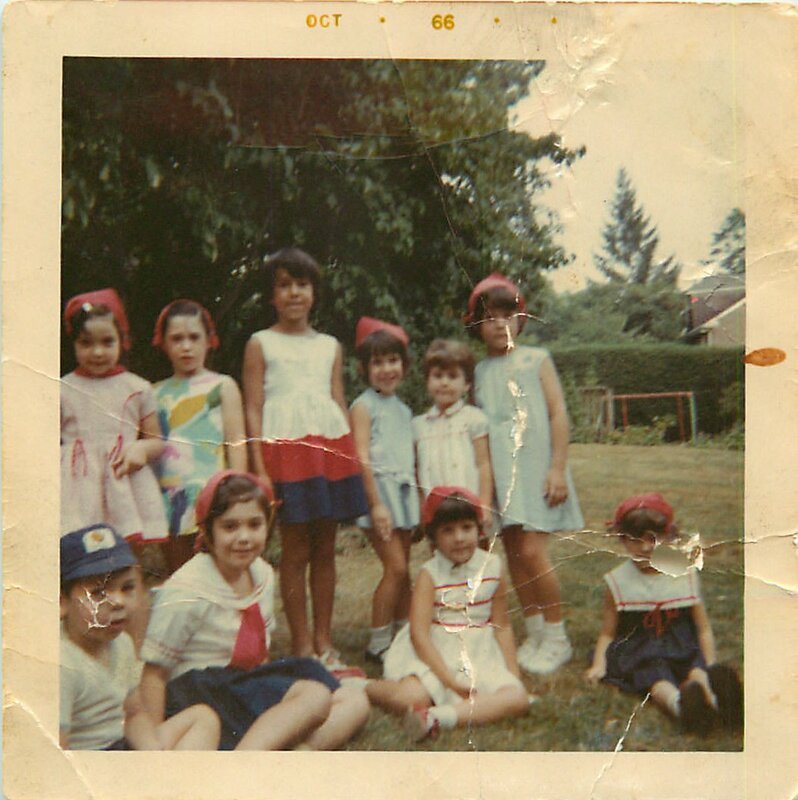 Lately, I’ve been more nostalgic than ever both for the foods of my childhood AND for the special friends who made up my parent inner circle when I was growing up in Brookline, Mass. in the 1960s and 1970s. My mother and Shani shared recipes and so much more. What springs to mind at once (even many years after Shani’s untimely passing) are the many laughs, the barbecues in Onset, Mass, their lively intelligence and intellectual curiosity, penchant for shopping and always finding the best bargains (I can picture them in the Weiner’s beautiful living room upon their return from an annual pilgrimage to the Filenes basement $45 suit sale), their elegant, brunette good looks (another memory now: someone coming up to me and Shani’s daughter Beth in synagogue saying “one of your mother’s wants you—I don’t know which). They were fun, elegant, and incredible hostesses, with a strong devotion to communal service, to their families and to hospitality. 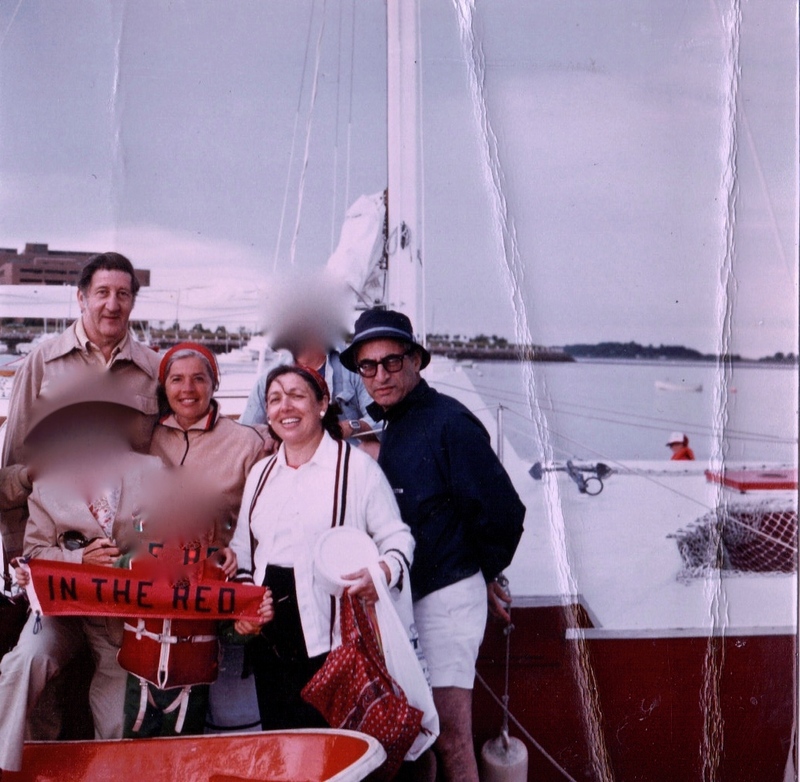 The Weiners & my parents on a Boston Harbor cruise (and yes, I blurred out some unidentified friends). It makes sense to see them at the beach, but I’m a little surprised that I couldn’t find any pictures from Onset. In 2015 the apple crumb cake may seem old-hat but somehow, it was new to us (or at least to me) in the ’70s. I have to confess, though, that it has seemed odd to me that in the cookbook my mom wrote, she included this “quickie dessert” (as mom called it) from Shani, because I always think of the elaborate day-long projects Shani would undertake. But this 1970s treat is delicious and these days we’d consider it healthful—if you substituted oats or nuts or whole-wheat flour for some of the flour. The recipe has always represented another quality of Shani’s to me: along with all the above attributes, she was also incredibly practical. There were times when it makes sense to have a quickie dessert and I smile when I make it and think of her ability to entertain so beautifully and seemingly effortlessly. Before I write the crumble recipe, I feel that I haven’t fully (in this short blog post) captured Shani. So one more sentence to say that she lit up every room: t was always more fun when she was around and you couldn’t keep your eyes off of her. So this may be a practical and simple crumb cake and I’d like to think that like Shani it has that extra something that comes through in a pinch and is the real deal. Sift flour. Add sugar and baking soda. Add oil and slightly beaten egg. Mix with fork until mealy. Press dough on the bottom and sides of a 9” pan, reserving 1 cup of dough. Place apples on crust. Crumble remaining 1 cup of dough over apples. Bake at 350° for 45 minutes. Serve warm. Can be served with ice cream or whipped cream. Lately, I’ve been serving an updated version of the crumble–especially when I have vegan company. I also make a versiont to accommodate gluten-free company. It’s based on a Mark Bittman recipe but I’ve made some changes. Whenever I change a Bittman recipe, I think that that’s exactly what Bittman would want me to do and I feel like a good student who is getting a gold star from the teacher. Just the right level of done-ness–beginning to brown. Photo by REG. Heat the oven to 375° F. Grease a 9” square pan. If you’re using frozen berries, set them in a colander to thaw while you prepare the crust. Put ¾ cup of the pine nuts in a food processor along with the butter and sugar. Let the machine run until the nuts are finely ground and the mixture is creamy and fluffy. Transfer the mixture to a bowl and add the whole pine nuts, flour (whole wheat or nut, as the case may be), and salt, and stir with a fork until crumbly. This can all be done for up to 3 days in advance. Spread the blueberries in the prepared pan and sprinkle with lemon zest. Crumble the topping over. Bake until the filling is bubbling and crust is just beginning to brown—30-40 minutes. Serve immediately or while still warm. This too can be served with whipped cream or ice cream (real or vegan) but it’s not necessary. And while both of these are incredible warm, they’re also great cold or room temperature. Sometimes you have to be practical.